The civil “Flag Day” ceremonies over, the afternoon was quiet, then as the sun just started to drop behind the mountain, some merry music made its way closer to my door. I looked out just in time to see the dancing kings entourage go by. 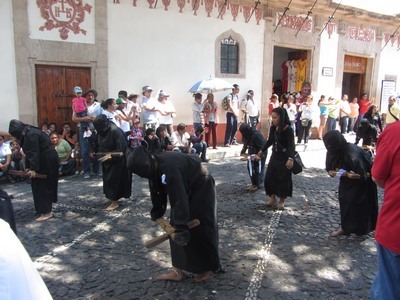 Apparently, as they do during Navidad and Las Posadas, each church in town takes a turn hosting a special Lenten event. Tonight, the Ex-Convento took their statues of Mary and Jesus out of the church and paraded them through town, to the accompaniment of merry music and dancing kings. I wonder how the dancers in their heavy costumes and full face masks, and the musicians too, manage to keep this merry pace up for over a mile all the way through town. They wear me out just watching them skip and dance down the street. As the sun began to drop behind the mountain, the music paused at the local church where airworks and church bells filled the air. Then the music and festivities began anew culminating in some beautiful fireworks, the real thing this time, with fire. It appears that in addition to the marching bands and celebrations on all the Fridays of Lent, I have a first, second, third, fourth, fifth, and sixth Tuesday to look forward to as well. This morning I was awakened before dawn by airworks – those booming cannon shot sounding fireworks (with no fire.) 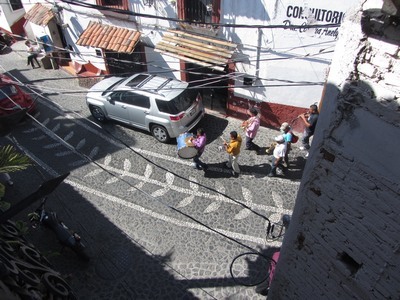 They continued throughout the day culminating in special church services, bandas parading through the streets, people singing, jumping into fountains, and other festivities. When I asked why, the only answer I would get is, “First Friday,” like I should know what that means. Since I am not Catholic and the only thing I know about Lenten traditions is that it is a time of penance, that follows the all out debauchery that is Carnival/Mardi Gras, and lasts from Ash Wednesday to Easter Sunday, I decided it was a good time to find out. 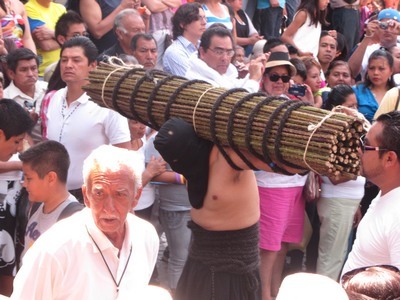 In Mexico, the word for Lent is Cuaresma, which comes from the word for 40 representing the 40 days Jesus spent in the wilderness. 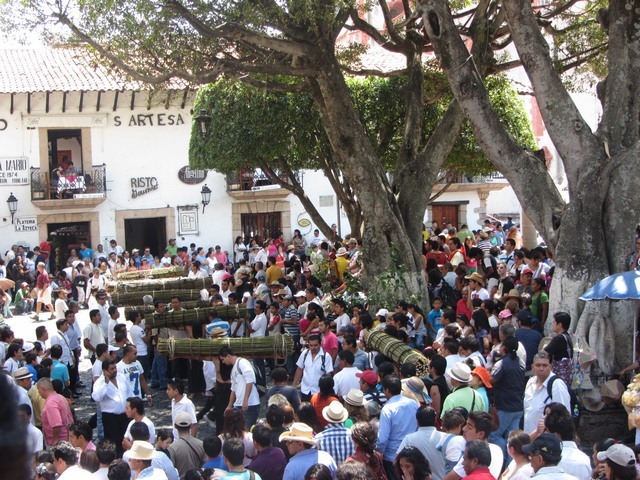 With Mexico being one of the most Catholic countries in the world, Lenten observances are an important part of the culture, filled with solemn observances, processions, and merriment. It is a time of church and family activities, sobriety and abstinence, with most Mexicans giving up eating meat on Fridays. So what is this First Friday all about? On the first Friday after Ash Wednesday, processions of “The Lord of Mercy” goes through the main streets of town, imploring mercy for sins. 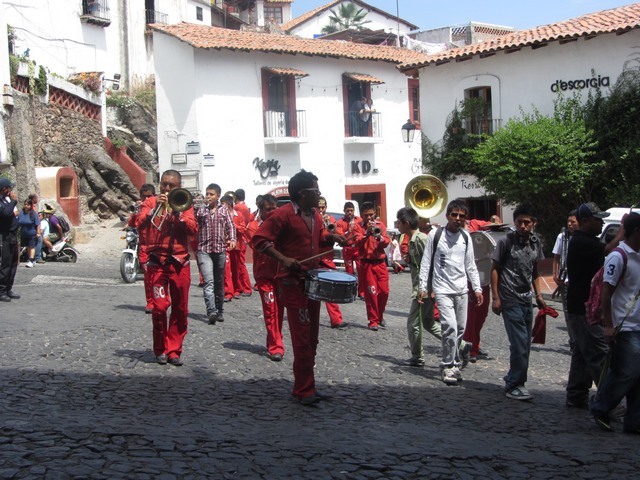 Rag tag bands of all sorts, wander the streets, which usually attract more of a Pied Piper following than any kind of solemn observance. My first year here, before I knew about First Friday and all the other Fridays that follow, I was told that the bands were to remind people that it was a holy time, which was really amusing considering they came marching over the hill playing Roll Out the Barrel, a quintessential drinking song. I now know that each Friday from now until Easter I will be awakened with airworks and serenaded to sleep by brass bands, each marking a special observance such as Dia de la Samaritana or Viernes de Dolores, the Friday of Sorrows, observed on the last Friday before Easter week in recognition of Mary’s loss of her son. 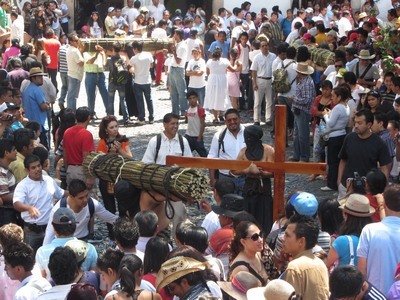 All of this leads up to the influx of thousands of penitents and onlookers for Semana Santa (Holy Week) in Taxco. Enough of a lesson for now. More later. Or visit the GoMexico Website.